Historic Randell Cottage in Wellington, New Zealand, has been a writers’ residency since 2001. With funding from Creative New Zealand Toi Aotearoa, the Wellington City Council, and New Zealand-France Friendship Fund, the Randell Cottage Writers Trust manages a six-month residency each year for a French and New Zealand writer respectively. We are supported in this work by the Embassy of France in New Zealand. 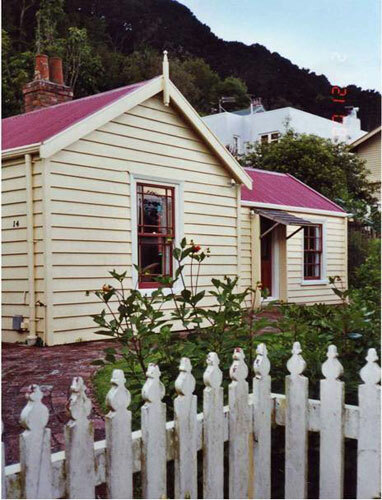 The cottage was gifted to Wellington by Beverley Randell, a descendant of the original owners, her husband Hugh Price, and their daughter Susan, as the first dedicated writers’ residency in the capital city, and the first for international writers in the Southern Hemisphere. It reciprocates in some measure for the Katherine Mansfield Menton Fellowship which sends writers to Menton, France, and adds an exciting perspective to the cultural and literary life of Wellington. With Katherine Mansfield being one of my strongest influences, New Zealand has been ensconced in my mind for such a long time. Randell Cottage is located in inner-city Thorndon close to the Lilburn Residence, Rita Angus Cottage, and the Katherine Mansfield House and Garden. This cluster of residencies is known informally as Arts Residencies Thorndon or ART and has led to mutual support and collaboration. Wellington is a lively literary centre and research hub and Randell Cottage is within walking distance of the National Library of New Zealand Te Puna Mātauranga o Aotearoa, Archives New Zealand Te Rua Mahara o te Kāwanatanga and the International Institute of Modern Letters Te Pūtahi Tuhi Auaha o Te Ao.